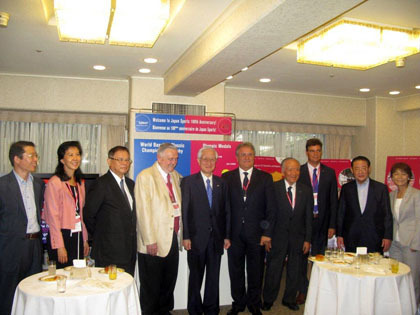 TOKYO, Japan - The Olympic Council of Asia's (OCA) General Assembly, coinciding with the 100th Anniversary of the Japanese Olympic Committee, set the scene for further Baseball-Softball discussions. The OCA General Assembly approved the inclusion of softball as a discipline of baseball for the 2014 Incheon Asian Games. Softball had been cut from the Asian Games program, as part of a cost reducing measure by the organizers, but with the collaboration with baseball, softball was able keep a presence at the Asian Games. Both presidents of the International Baseball Federation (IBAF) and International Softball Federation (ISF) were on hand to hold talks and await the official announcement. IBAF President Riccardo Fraccari reacted cautiously, but positively to OCA’s affirmation of the joint-proposal. "Softball's pairing with baseball as part of the Asian Games program is a great sign given to us by the Olympic Council of Asia,” Fraccari said from the ISF-IBAF presentation suite. “We are all very happy with the positive outcome here in Tokyo, as this will guarantee the inclusion of more female athletes. This result is also a strong indicator of the cooperation between the baseball and softball camps, and speaks of the potential for our institutions to move forward in such a manner,” Fraccari added. The baseball head recognized the difficult task that IBAF and ISF have before them in their ambitions to be reinstated for the 2020 Olympic Games. “There is still a lot of work to do and not very much time [before 2013], so we need to sit down together to review and develop upon this decision here in Tokyo," said Fraccari. The next moves for the IBAF and ISF could involve forming a joint commission to analyze the strategy for an official cooperation and campaign between the two institutions.